As early as October 1946, the Air Corps had launched its first major investigation of design approaches for a supersonic bomber, called the first Generalized Bomber Study, or GEBO I. 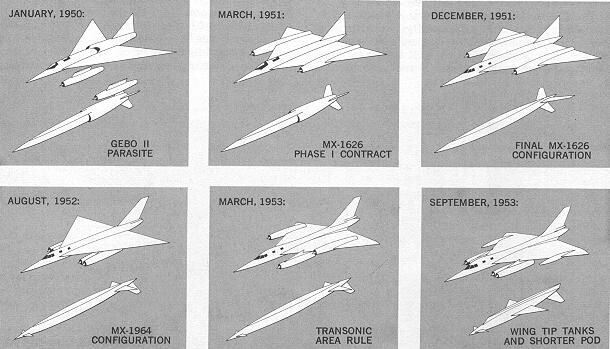 With Martin beginning to lose ground following lack of success of its XB-48 and XB-51, the three remaining World War II leaders in the field of bomber development - Boeing, Convair (the corporation subsequently became a division of the General Dynamics Corp), and North American - became locked in an intense competition for development of the next-generation supersonic medium and heavy strategic bombers. Despite its dramatic successes with the B-47 and B-52 programs, Boeing eventually found itself at a distinct disadvantage. Boeing showed great strengths in large subsonic jet bombers, mili- tary transports, and commercial jet aircraft. But Boeing had not developed a production fighter or even a fighter prototype since the 1930s and did not appear to have good prospects for winning a new fighter R&D competition in the early 1950s. Yet development of supersonic long-range bombers posed even greater technological challenges than supersonic fighters. Many of the cutting-edge technology breakthroughs and design solutions related to supersonic flight were being generated in fighter and fighter-related R&D programs. Convair and North American, on the other hand, had focused on the development of supersonic flight early in the jet age and had emerged in the 1950s as industry leaders in supersonic fighter R&D. 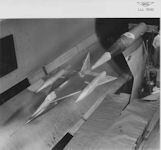 Convair had received Air Corps support in 1945 to use German delta-wing data to examine supersonic fighter concepts. By 1948, Convair had developed and manufactured the delta-wing XF-92A prototype in close cooperation with the Air Force and the National Advisory Committee for Aeronautics (NACA), forerunner of the National Aeronautics and Space Administration (NASA). Originally intended as a Mach 1.5 fighter interceptor, the XF-92A became a one-of-a-kind fighter technology test vehicle. Although soon handed over to the Air Force for further flight testing, the XF-92A formed the basis for Convair's successful entry in the 1951 supersonic fighter competition, which led to the F-102 and F-106 delta-wing fighters. Meanwhile, North American forged ahead at the beginning of the 1950s with its Sabre 45 supersonic fighter design derived from it enormously successful F-86 jet fighter, ultimately resulting in the highly successful supersonic F-100. But Boeing remained very much in the running throughout most of the medium supersonic bomber competition. Convair's study experience was extensive, but Boeing had also done much work of its own. Soon after the end of World War II, Convair had won a major GEBO I study contract to investigate supersonic bomber configurations and design approaches and had examined about 10,000 configurations through the late 1940s. In requesting GEBO, the AAF called for determination of which design trends would be necessary to achieve unspecified, yet ambitious supersonic performances. Of necessity, the scope of the study was very broad, but "investigation of low aspect wings in general and Delta Wings in particular" was emphasized. Although already acquainted with the delta wing and, therefore, well suited for the work, Convair had to investigate countless configurations to determine the effects of wing area, aspect ratio, thickness and sweep, as well as the impacts of type (turbojet and turboprop), size, and number of engines on airplane speed, range, and gross weight. The GEBO findings were described in 3 reports, which were completed in June 1948. Yet, this was only a beginning. Indicative of the magnitude of the project, in late 1948 the Air Materiel Command (AMC) Engineering Division of the now independent Air Force asked for a continuation of the GEBO study. The USAF engineers presented many valid reasons for their request, but their most telling arguments were that the findings so far obtained be used to show the "feasibility of military characteristics;" and to assist in establishing "balanced characteristics and desirable design compromises." Meanwhile, pre-GEBO studies, conducted by Convair, had formed the basis of the winning interceptor design submitted by the company in 1946. 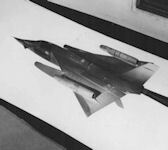 Forerunner of the F-102, the ensuing rocket-propelled, XF-92 interceptor was extremely costly and highly impractical. Though the aircraft failed to earn a production contract, it proved to be an important step in the development of the delta wing, one of the future B-58's most striking features. The delta wing itself, like many other aerodynamic innovations, had its inception in the German wind tunnels of World War II (While the word "delta" is inextricably linked to the work of Alexander Lippisch, a brilliant aeronautics scientist, his work followed a path first taken by John Dunne, who developed such aircraft in Great Britain prior to the First World War. Actually, Dr. Lippisch's efforts parallelled those of G. T R. Hill and the Westland company in Great Britain and that of John K. Northrop in the United States). Although the National Advisory Committee on Aeronautics, independent of the German research, by 1945 had explained many of the delta configuration's theoretical advantages, the delta wing concept remained credited to Dr. Alexander M. Lippisch, leader of the German program (His primary interest lay in proving his assumption that aircraft could have the appearance of a flying wing and still be practical-a delta-wing aircraft from which came the modern delta supersonic design). In postwar years, U.S. governmental agencies and many of the American aircraft corporations studied extensively Dr. Lippisch's captured reports, with data on his never-flown, rocket-powered DM-1 glider and his spectacular, if not very successful, Messerchmitt-built Me-163B (the first operational liquid rocket propelled interceptor), introduced by the Germans in August 1944. Yet, while Dr. Lippisch was not the inspiration that caused Convair to continue working on the 60-degree delta, his comments reinforced and encouraged Convair engineers to believe that the delta wing could solve most of the problems of supersonic flights. Nature, Dr. Lippisch wrote, had designed the flying wing thousands of years before man even thought of flight. The flying wing was the Zanonia seed, a seed from a large vine of the cucumber family. It grew in the dense, moist jungles of Indonesia and adapted its reproductive processes to a region in which there was no wind to distribute the seeds. The vine climbed 150-foot trees, and from the top, the seed-a kidney-shaped platform-began its glide, rising on thermals from the jungle heat, and finally landing at considerable distance from its point of departure. The aerodynamic qualities of the seed attracted attention. Two Austrian engineers, Etrich and Weis, analysed its stability. Etrich eventually combined the Zanonia wing with a conventional monoplane configuration, known as the Etrich "Dove". The Dove became famous is the days before World War I, as the first German military aircraft. Its demise followed the onset of war, when it was abandoned in favor of the more maneuverable Fokker-designed aircraft. The initial requirements for a new bomber were emphasized in 1947 by Maj. Gen. Curtis E. LeMay, Deputy Chief of Air Staff for Research and Development. In spite of the declining post-war budget, General LeMay directed improvements in research and development. He also asked for more money. Appearing often before congressional committees, he pointed out on one occasion that the entire annual budget of the propeller division at Wright Field, "wouldn't buy one set of B-29 propellers." In May, General LeMay wrote directly to Lt. Gen. Nathan R Twining, AMC Commander, to urge that studies be undertaken of a new jet bomber that could become operational in the late 1950s. This airplane, General LeMay stated, should have a combat radius of 2,500 miles, a cruising speed of at least 500 miles per hour, and a gross weight of about 170,000 pounds. No amount of modification to the B-50 or B-36 would bring these airplanes within the desired characteristics, General LeMay added. A completely new medium bomber was needed, and development and procurement of such an airplane could well follow the B-52's development. That the B-58, generated by the post-World War II enthusiasm for the unconventional delta-wing configuration, evolved from requirements advocated by General LeMay was to prove ironic. Meanwhile, General L,eMay's insistence prompted the Air Staff to solicit ideas about a new bomber from the Boeing Airplane Company of Seattle, Washington. Yet, several years would pass and many changes would occur before any specific projects started taking shape. GEBO I ended in 1949. The shortage of funds forced the Air Force to make difficult decisions. Boeing's XB-55, a design initiated as an immediate result of General LeMay's 1947 request, had been cancelled in January 1949 for lack of money, as well as the following reasons (requirements for a new medium bomber, submitted to industry in October 1947, proved Boeing the undisputed winner of the ensuing competition). On 06 June 1949 the Air Force issued a contract for GEBO II, which specifically looked at medium supersonic bomber concepts. Convair, Martin, Douglas, Fairchild, and other companies took part in this and other related studies. For its part, Boeing had been conducting supersonic medium bomber studies as part of the XB-55 study program starting in late 1947. Convair and Boeing soon emerged as the leading contenders and, by late 1950, were the only serious competitors. Martin and Douglas submitted proposals in 1951, which were rapidly rejected. Apparently fully involved in its fighter development programs, North American did not even bother to submit a design proposal. As suggested by AMC, Headquarters USAF asked Convair to begin a second generalized bomber study for the development of future long-range supersonic bombers. GEBO II was formalized by contract AF33(038)-2664 and, like GEBO I, ended covering a myriad of configurations. There were many justifications, besides AMC insistence, for the Air Staff's continued interest in the Convair research. First, there no longer seemed to be an immediate need to originate a design to meet the medium bomber requirements, in view of the currently projected B-47 growth. Also, since the XB-55's development promised to take longer than anticipated, the Air Force thought its design should have been predicated on greater aerodynamic achievements and an improved propulsion system. Finally, and most importantly, continued testing of the delta wing XF-92, first flown in June 1948, was starting to attract wide attention. Even though the Board of Senior Officers in early 1949 had rejected an unconventional strategic bomber proposed by the Fairchild Aircraft Corporation, it was obvious by mid-year that the Senior Officers, with Secretary of the Air Force Symington's full support, were searching for new and imaginative solutions to the strategic bombing problem. While looking for novel ideas, the Air Force remained cautious and did not lose sight of Boeing's extensive experience in bomber design. The experimental B-47 earned a first development contract in December 1943; the XB-32, in July 1948. As already noted, the contractor had been encouraged to investigate the development of higher-performance aircraft, long before its XB-55 was cancelled. Boeing, therefore, had worked on a series of new turbojet designs in order to compare them with its original turboprop studies and with the XB-55 in particular. Aware of these facts, the Air Force issued termination orders for the XB-55 in such a way as to allow maximum benefit from the studies which Boeing had in progress. Mockup and detailed engineering on the XB-55 were stopped, but the study reports and tunnel tests then underway were to be completed. Moreover, the Air Force soon increased the scope of the Boeing tunnel tests and asked for firm study results. On 26 January 1951, following completion of GEBO II, Convair offered to develop and manufacture a long-range supersonic reconnaissance bomber. Reconnaissance had not been mentioned before. Most likely, the Heavy Bomber Committee's year-old decision that the heavy bomber program be expanded to include reconnaissance, accounted for the Convair suggestion. As far as Boeing was concerned, reconnaissance, as an adjunct to bombing, was almost routine, the RB-47B being already on the drawing board in March 1951. The proposal, named Project MX-1626 by AMC, was accepted promptly by the Air Force. However, this did not spell the end of Boeing's related work. 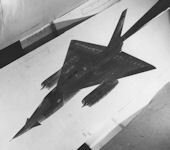 The Air Force endorsed in February 1951 the Phase I development of 2 reconnaissance bombers through wind tunnel testing, engineering design, and mockup. Convair and Boeing received follow-on study contracts for continued refinement of their proposals, including extensive wind-tunnel testing. By the next year, Convair's design was clearly viewed by the Air Force as superior. Nonetheless, another follow-on competitive design study was funded for the two contractors, with a final decision planned for early 1953. Both designs were estimated to be capable of Mach 2 performance and ceilings over 50,000 feet. The Boeing project was designated MX-1712 and was initiated on 26 February 1951 by Letter Contract AF33(038)-21388. Boeing's XB-59 proposal was a conventionally configured design, which ironically called for four engines imbedded in the fuselage at the wing roots. A similar document, Letter Contract AF33(038)-21250, had been signed by Convair on the 17th. It called for a 107,000-pound reconnaissance bomber, with a delta configuration and 2-stage system (release and retrieval) based on the parasite principle, using the B-36 as the carrier. The Convair design proposal, designated the XB-58, was by far the most technologically daring of the two. It had evolved into a delta-wing configuration closely re- lated to the XF-92 fighter technology demonstrator and the compa- ny's F- 102 proposal-which had won the fighter design competition in August 1951-with four podded jet engines under the wing, similar to existing Boeing bombers. The Convair MX-1626's basic difference from the other Convair configurations studied in GEBO II lay in the use of 3 engines, 2 in wing nacelles and the third in a droppable bomb pod. In contrast, the Boeing MX-1712 project proposed a conventional, 200,000-pound medium-range reconnaissance bomber, capable of supersonic flight over a limited portion of its mission. The Boeing design objective involved a 2,000-nautical mile radius, 200 miles of which would be flown at Mach 1.3 or more, and the balance at Mach 0.9. For shorter missions, the supersonic radius would increase, while range extension devices such as refueling or extended wing tips would lengthen the range for longer missions. Power was to come from 4 J67-type engines with afterburners, and the aircraft as projected was to be capable of delivering atomic or conventional bombs from altitudes of 45,000 to 50,000 feet. Sea-level missions were another possibility being considered. The parasite-carrier combination, proposed by Convair in early 1951, did not last long. As conceived, Project MX-1626's primary appeal stemmed largely from the stringent fiscal restrictions of the post-World War II period. Like the Glenn L. Martin Company, Convair at one point was also working on a Navy proposal for a money-saving carrier-based medium-range bomber. Since money was lacking, the parasite-carrier concept appeared to be the most economical method for tackling the unconventional approach to the long-range, strategic bombing problem. During 1951, however, the Air Force started to view MX-1626 from a different angle. Both the B-36 carrier and parasite aircraft (officially designated B-58 in December 1952) would require complete navigation equipment; the 2 might not locate one another on the return course of the mission; and once rejoined, the composite aircraft would be more vulnerable to attack. Finally, the 2-aircraft attack system would be far more expensive to build and maintain than would a single bomber. Hence, in December 1951, the MX-1626 configuration was altered drastically. The parasite mode of range extension was dropped in favor of air refueling; the third and expendable engine in the bomb pod of the original configuration was eliminated, while afterburners were added to the aircraft's remaining 2 engines. Moreover, a landing gear was provided to allow take-off at a gross weight of about 126,000 pounds, and the number of crewmen was increased from 2 to 3 (1 pilot, 1 navigator-bombardier, and 1 defense-systems operator). The Convair MX-1626 evolved further into a more refined proposal redesignated MX-1964. The NACA 16-Foot Transonic Tunnel Test 118, which was conducted in January 1953, is listed in the tunnel log book as "MX 1964 Drag Test Model (Convair)". At some unknown date, the tunnel log book was corrected from MX 1964 to MX 1626. The MX numbering system was the classified USAF project designator system similar to today's code word system for classified projects. MX-1964 was the USAF project designation for the long-range supersonic bomber XB-58 Hustler aircraft and was a continuation of USAF MX-1626 project which was a Convair supersonic bomber/reconnaissance aircraft study (Convair Model W-4). MX-1626 was, in turn, a continuation of the USAF project MX-871, which was a Consolidated-Vultee generalized supersonic heavy bomber study. It is interesting to note that the weapons pod carried by the production B-58 aircraft was originally a strategic high-altitude air-to-surface missile designated MX-1964-A. Regardless of the correct project designation (probably MX-1626), the early B-58 Hustler development model featured mid-wing mounted, single engine-nacelle on each wing and the long weapon, or weapon pod, mounted under the fuselage. Based on the tunnel log description, the model (note faired-over nacelle inlets) was used to determine the subsonic/transonic drag characteristics of the aircraft configuration. Test 120 was a follow-on test to Test 118 except the USAF project had progressed to a competition between Convair (MX-1964) and Boeing (MX-1965). Test 120 was conducted in two tunnel entries during July 1953 to September 1953. 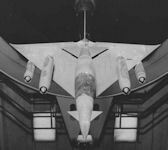 The first entry was labeled in the run log as a pressure test; the second entry examined the aerodynamic effects of a cambered and uncambered wing, elevon settings, nacelle integration (split and siamese), and fins on the weapons pod. In late 1952, Convair won the design competition to develop America's first supersonic bomber. Some claimed that the Boeing design was probably as good as Convair's submission but that selection of the B-52 and cancellation of the YB-60 around the same time may have influenced the decision on the supersonic bomber competition for industrial-base reasons. This assertion seems unlikely. Boeing's proposal was apparently clearly inferior in supersonic capability. According to the official Air Force history, the final design evaluation by the Wright Air Development Center had "left little doubt about the forthcoming decision." Air Force experts concluded that the Boeing design "would produce either an aircraft of small size with mediocre supersonic speeds or one so large as to almost preclude any supersonic capability." In addition, the Air Force determined that Convair was considerably further along in its design study than Boeing. The apparent technical superiority of Convair's proposal is not hard to explain. Convair had more experience in investigating supersonic bomber concepts, beginning with the 1945 GEBO I study and flight testing of its proposed supersonic delta-design configuration with the XF-92 fighter demonstrator. Furthermore, Convair could take advantage of synergies between its F-102, F-106, and B-58 development programs. Indeed, by the time Convair won the supersonic bomber competition, its B-58 design proposal had evolved into a scaled-up and refined version of the F- 102. The original B-58 design was substantially modified in accordance with the "area rule" concept discovered during the F-102 program in 1952. In another example, the leading edge of the B-58 wing was redesigned before first flight to incorporate the "conical camber" design concept also developed on the F-102 program. Because of the extremely harsh demands placed on aircraft structure, propulsion systems, and other areas by sustained flight at twice the speed of sound, development of the B-58 pushed the very frontiers of current knowledge on aerodynamic design, materials, engines, avionics, and many other areas.